Proteins are the workhorses of the typical cell. Originally coded for by DNA and composed of a sequence of amino acids, proteins serve a variety of roles including binding other molecules and/or transporting them, serving as 'switches' for cellular activity, catalyzing chemical reactions, and even acting as structural building blocks. It should come as no surprise then that in order to accomplish all these goals, proteins are needed in a variety of locations both inside and outside of the cell. Therefore, a variety of mechanisms have evolved in order to correctly localize proteins, helping to guide them from their point of synthesis (at the ribosome) to their destination. One such set of mechanisms is the secretory pathway. Also ubiquitous in biological systems are membranes, barriers between the cell and the outside world. Membranes also serve to divide compartments within some cells (those of eukaryotes). In order for proteins to get to where they are needed inside these compartments or outside the cell, they need a way to cross the membrane without rupturing it at the same time. The secretory pathway consists in part of a channel for just this purpose: the translocon ( ). A schematic of the translocation process. The ribosome docks with the translocon where the signal sequence (triangle) is recognized. This then opens the channel allowing the protein to go through. The translocon may be comprised of multiple proteins, but the core component is a heterotrimeric protein known as the Sec61 complex in eukaryotes, SecYEG in bacteria, and SecYEβ in archaea. Despite their differences, all function in a similar way. The ribosome, the factory for all proteins, docks with the translocon where it begins feeding the new, still linear, protein into the channel as it's being made, a process known as co-translational translocation (see also our ribosome research page). The channel appears to open up just a few angstroms wide, not enough for a completely folded protein but enough for a perhaps a helix. To guarantee not just any molecule can cross the channel though, the translocon will only open for proteins displaying the right 'key', in this case, a short specific amino acid leader sequence. This key is recognized by SecY/Sec61 itself, although the manner in which this causes the channel to open is still a mystery. Originally theorized over 30 years ago, it was the hypothesis of this key and channel combination that earned Günter Blobel the Nobel Prize in Physiology or Medicine in 1999 ( ). Once the channel has been opened, some may assume that it is a passive conduit for the nascent proteins being fed into it. However, this is actually where the channel begins its most complex role, that of deciding whether to place the protein on the other side of the channel or to insert it into the membrane. While translocation of soluble proteins across the membrane appears to be straightforward, there are different suggestions for how segments of protein destined for the membrane insert into it. Some ideas include modification of SecY/Sec61 by the ribosome ( ) or a thermodynamic partitioning of the hydrophobic transmembrane protein segments between the solvated channel interior and the hydrophobic membrane core while inside the channel ( ). Regardless, it seems clear that large structural changes are required to open this channel both to membrane as well as to the opposite side. SecYEβ, shown here both from the side and from above and also in its native membrane/water environment (click for a larger view). A small polypeptide (protein segment) is crossing the channel and pushing open the plug of SecY. 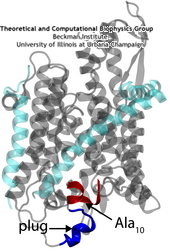 The recent availability of a crystal structure of SecYEβ ( ) has brought into focus some aspects of the protein translocation process. Two key structural elements were identified that help keep the channel closed before and during translocation. First is a 'plug', a small helix blocking the channel's periplasmic side (opposite of where proteins are fed into the channel). Second is a 'pore ring', a constriction point at the center of the channel consisting of a few residues from different helices. Molecular dynamics simulations using the program NAMD have allowed us to characterize these elements and confirm their hypothesized function (described more thoroughly in a recent paper ). During simulated translocation of short polypeptide helices, the plug was seen to leave the channel and then, after translocation, return partially to its original location. Also, the pore ring blocked water and ions before translocation; during translocation, it expanded enough to allow the polypeptide segment through but did not allow any ions through and only a few water molecules. Another question perhaps made more complicated by the atomic structure is that regarding the oligomerization of SecYEβ. While some proteins function only as monomers (single copies), many form larger structures such as dimers (two copies), tetramers (four copies), or, in general, polymers (n copies). The SecY/Sec61 complex is known to form dimers and tetramers in nature but it is not clear why. One original hypothesis was that the channel formed at the center of the four protein complexes. However, the structure along with other experiments and our simulations seem to demonstrate that the monomer is capable of forming the channel. 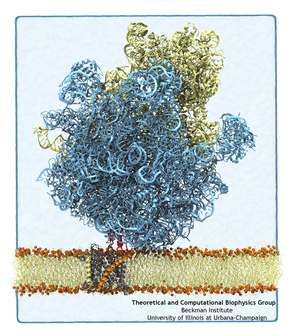 The question then remains: what purpose does the tetramer serve? We have attempted to begin answering this question by simulating a SecYEβ dimer in a back-to-back conformation (although a front-to-front conformation has also recently been proposed ). We discovered that during the simulation, the plug of each SecYEβ became destabilized, much more than in the simulation of a single SecYEβ. Thus, in this way, cooperative interactions between the two copies of SecYEβ may aid translocation through a single monomer. Click the image above to see a movie made from a simulation of translocation through SecY. Shown from the top, the polypeptide is in blue, the plug in red, and the pore ring residues in yellow. Click here to see the same simulation from the side. Steered MD was used to force open the lateral gate (click for a larger view). The other function of the translocon, inserting proteins into the membrane, is accomplished by means of a lateral gate, hypothesized based on the structure ( ). Simulations of forced gate opening and relaxation revealed how the structure responds. In particular, the two approximately symmetric halves of SecY were found to stay reasonably stable during opening, agreeing with the "clamshell-like" behavior proposed previously. Additionally, SecE, the accessory protein surrounding SecY, did not affect the rate of gate closure; this was surprising as SecE had been assumed to act as a clamp, holding the two halves of SecY together. Also, it was found that by opening the gate, interactions with the plug were broken, freeing it. This is potentially how gating by a signal sequence occurs, where the inserted sequence pushes (or holds) open the lateral gate, thus freeing the plug and loosening the channel as a whole before translocation. Click here for a movie of gate opening. Also of interest was the behavior of lipids during gate opening. 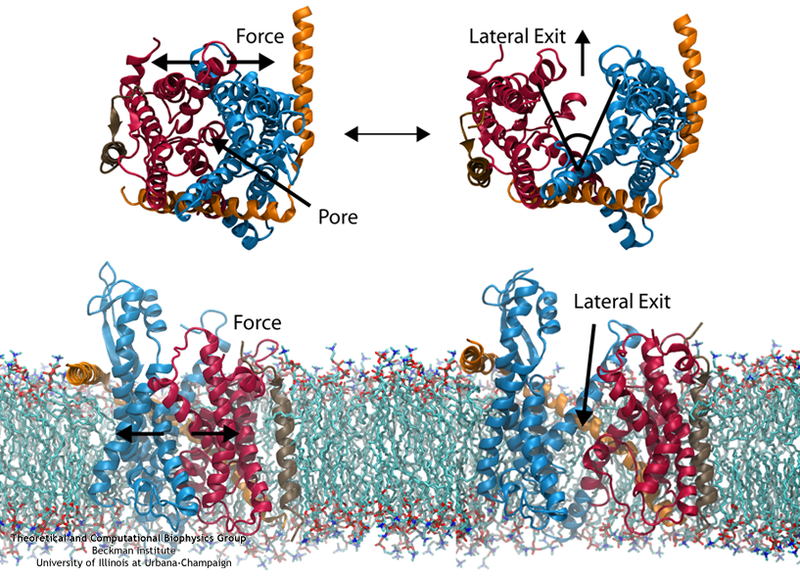 It has been suggested that if the lateral gate opens directly to the bilayer (as opposed to another translocon next to it ), it would become inactivated by lipids flooding the channel. To explore this suggestion in more detail, we simulated SecY with the lateral gate held open to the bilayer, both in an all-atom representation and a reduced, coarse-grained representation. Surprisingly, we found after up to 1 microsecond, lipids did not invade the channel. Instead, they clung to hydrophobic gating helices or remained firmly stuck in the bilayer. Given also that a transmembrane segment of an inserting protein probably occupies this region most of the time, it is probably unlikely then that lipids pose any threat to the channel. (left) The system used for simulating the channel. (middle) The channel shown with the native (green) and two mutant (red and blue) plugs. (right) A closeup of the pore ring in one of the mutants with two residues not shown in order to illustrate water permeating the channel (click for a larger version). While previous simulations indicated that both the pore ring and plug played some role in closing the channel, it remained unclear what their independent roles are. 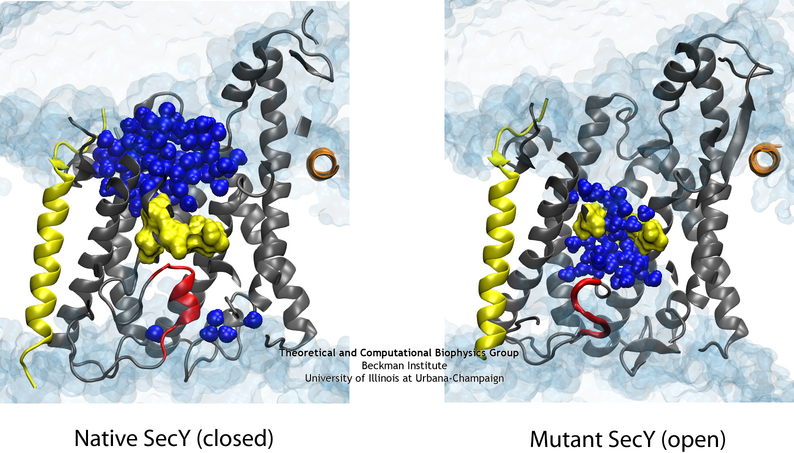 Two recently solved structures of mutants further complicated the picture . Specifically, two mutants with either half or all of the native plug deleted formed new plugs from the remaining residues. These mutants demonstrated that having a plug is important for the channel, but how well do the new plugs function? Various experiments indicated they do not function as well as the native plug, but also do not kill the cell . Electrophysiology experiments demonstrated that the mutant channels permit intermittent permeation of water and ions whereas the native channel is water tight . However, the crystal structures of the two mutants still show the channel as closed by the pore ring at the channel's center. The difference in the permeability is apparent when comparing the native (left) and one of the mutant (right) channels in simulation. To reconcile the closed structures of the mutants with their experimental permeabilities, we performed multiple equilibrium simulations of the native channel and the two mutants. We measured the permeability of each channel to water, finding increasing diffusive and osmotic permeabilities corresponding to the amount of the plug deleted. The increase in permeability was also found to correspond to an increase in the motions of the new plugs and, in particular, the pore ring residues, suggesting that pore ring flexibility, controlled by the plug, is the primary determinant of channel openness. To confirm this suggestion, we performed a unique computational experiment in which the interactions between water and the plug in the native, closed channel were eliminated, making the plug "transparent" to water. By doing so, we separate the role of the plug as a purely steric barrier to the flow of water from its role as a lock, holding the channel closed. We found in simulations that this hybrid channel permitted almost no water permeation, significantly less than the mutants where even only a fraction of the plug was deleted. Thus it appears that the plug's role as a steric barrier alone is significantly less important than its role holding the pore ring closed. 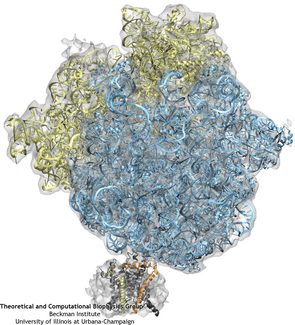 The ribosome (blue and yellow) is docked to the channel (grey, orange, and yellow) as a result of fitting to the cryo-EM map (grey transparent surface). Once the fitting was completed, a system containing ribosome-SecY complex, ions, membrane, and water was built. The system contains 2.7 million atoms in total. Our previous studies focused on the behavior of the channel alone, under different conditions. However, the channel always works in concert with partners, such as the ribosome, noted above. Nearly all information on ribosome-channel complexes has come from cryo-electron microscopy (cryo-EM) maps, which provides relatively low resolution images of the complex. From these maps, it was deduced that either a dimer or tetramer of SecY/Sec61 binds to the ribosome. Such deductions were based primarily on the size of the density present in the channel region, since specific features were undetectable at their present resolution, leaving open the question of precisely how many copies of the channel are actually present in the complex and in what orientation they are. Many of the limitations of previous maps have been overcome recently though. For the first time in 2007, a monomer of SecYEG bound to a ribosome was captured in a cryo-EM map ( ). By combining this map with high-resolution crystallographic structures of the separate ribosome and channel, a high-resolution structure of the complex could be generated. This combination of data from multiple techniques was accomplished through the use of molecular dynamics flexible fitting (MDFF), a recently developed method which drives an atomic structure into a new conformation represented by the cryo-EM map in an MD simulation (more info on our MDFF webpage). The resulting model of the ribosome-channel complex revealed, in particular, the sites of ribosome-SecY interaction that maintain the complex. We found the interactions map to four specific regions of the channel, namely the two cytoplasmic loops of SecY, the C-terminus of SecY, and the amphipathic helix of SecE (see the figure on the right). All four sites of interactions are conserved across different domains of life and even different binding partners. For example, the structure of the bacterial post-translocation partner, SecA, with SecY also display interactions which involve the two cytoplasmic loops and C terminus of SecY ( ). 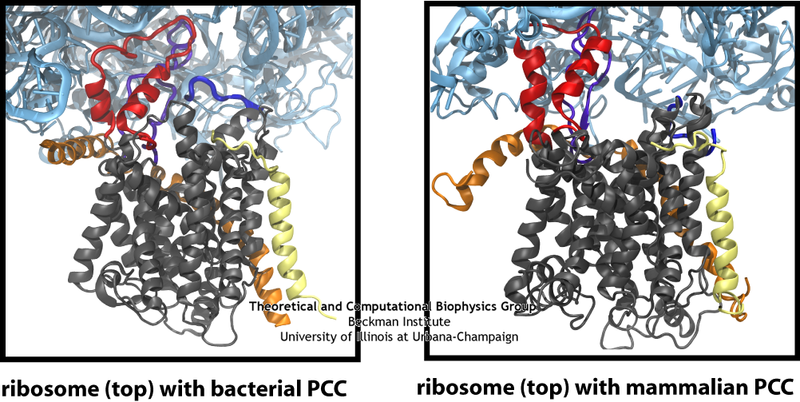 The similarity of the connections between the ribosome and channel in the bacterial and mammalian systems is clearly seen in this side-by-side comparison, particularly the two loops of the channel in red and purple. 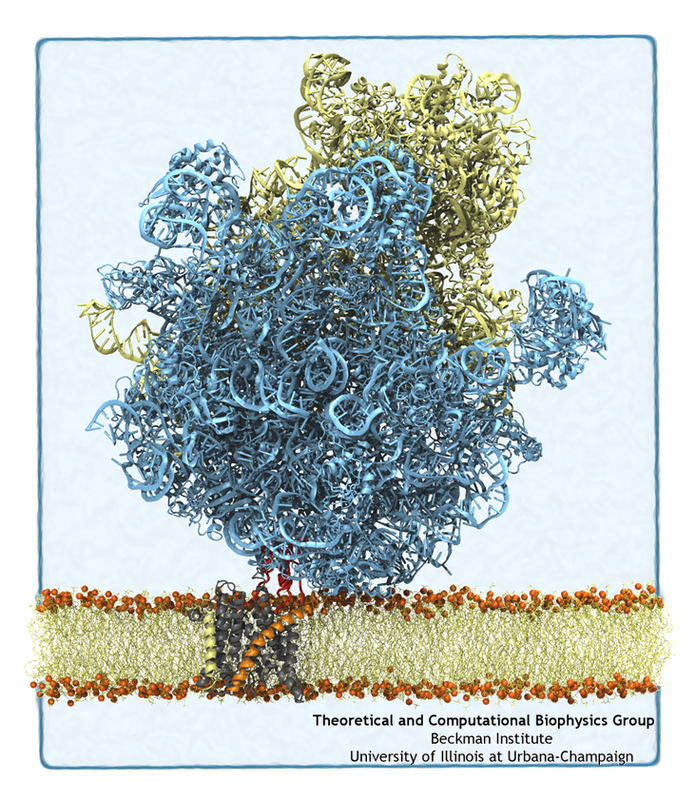 Using the atomic-scale structure of a ribosome-channel complex, we prepared a system containing also ions, membrane, and water, requiring altogether 2.7 million atoms. The subsequent simulation, among the largest all-atom simulations every run to date, illustrated the effects of ribosome binding on the channel. We found that the bound ribosome induces a slight destabilization of SecY's plug, possibly representing a "priming" step, preceding insertion of the signal sequence. This effect could be mimicked solely through restraint of the two cytoplasmic loops of SecY with no ribosome present, indicating how multiple channel partners can influence SecY despite all being unique. Additionally, we simulated translocation of a short polypeptide from the ribosome's exit tunnel into the channel. The movement of the polypeptide did not significantly disturb binding between the ribosome and channel, demonstrating that the complex is functional. 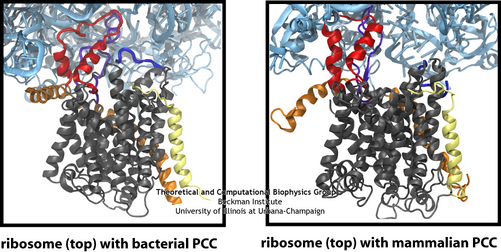 Finally, we also modeled a back-to-back dimer of the channel bound to the ribosome. The ribosome-SecY-dimer complex was more stable than the ribosome-SecY-monomer complex, suggesting that dimers or tetramers of the channel may form to increase the strength of binding to channel partners, although only one channel is functional. In addition to the bacterial ribosome-SecY-monomer complex, cryo-EM maps have recently been obtained for eukaryotic ribosome-Sec61-monomer complexes as well ( , }. For the highest resolution maps, the detail is sufficient to observe secondary structure elements for the channel itself, something not possible previously. As in the case of the ribosome-SecY-monomer complex, MDFF was used to fit atomic models of the Sec61 channel to a map of an actively translating mammalian ribosome-Sec61-monomer complex, with a nascent polypeptide present inside the channel. The fitted structure of the complex revealed connections between ribosome and channel similar to those observed previously for the ribosome-SecY-monomer complex. Additionally, the N terminus of Sec61α was found to contribute to ribosome binding. This result offers further confirmation that a monomeric channel bound to the ribosome is functional, and thus places significant limits on any potential role of dimers or tetramers of the channel in translocation. Each frame links to a different movie. (1) Ribosome-SecY-membrane system. (2) Overview of the MDFF procedure. (3) Interactions between ribosome and SecY. (4) Hypothetical ribosome-SecY-dimer complex. (5) Translocation of a small polypeptide from exit tunnel to channel. Page created and maintained by JC Gumbart. 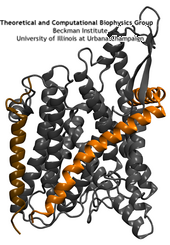 Regulation of the protein-conducting channel by a bound ribosome. James Gumbart, Leonardo G. Trabuco, Eduard Schreiner, Elizabeth Villa, and Klaus Schulten. Structure, 17:1453-1464, 2009. Contact Us // Material on this page is copyrighted; contact Webmaster for more information. // Document last modified on 06 Jul 2015 // 55484 accesses since 21 Mar 2006 .